The idea that cold milk gives toddlers stomach cramps is simply an old wives tale. There is no medical necessity for warming your toddler's milk before he drinks it. Since warming milk can be tiresome and time-consuming, switching to cold milk can free up your time and help your toddler experience something new. While your child may prefer his milk warm, transitioning to cold milk is a fairly easy task when you take your time and offer plenty of praise. Offer milk in the same cup as you always have and minimize changes during the transition period. Toddlers can become stubborn and defiant when encountering change, so it's best to keep the changes to a minimum for the greatest chance of success. This also eliminates the possibility that your toddler is refusing milk because of the cup. Warm the milk to a few degrees less than you normally would. For instance, if you typically microwave the milk for 20 seconds, only microwave for 15 seconds so it's slightly less warm than usual. Offer the milk and your toddler will likely not notice the slight difference in temperature. Continue decreasing the temperature of the milk. Take a day for your toddler to adapt to each time the temperature changes. Rushing the transition could cause defiance and you may have to start again with the process. Praise your toddler for drinking the milk. Avoid making references to the milk being cold. Instead, offer encouragement by saying that she is drinking milk "just like mommy" and tell her that the milk tastes good. This creates a positive response between drinking cooler milk and the response your toddler gets. Offer completely cold milk at meals once the transition has taken place. While your toddler may associate warm milk with nap or sleep time, making the transition at mealtimes is less frustrating, since it won't interrupt your toddler's routine. Once your toddler has become used to cold milk at meal times, you can introduce it at bedtime. 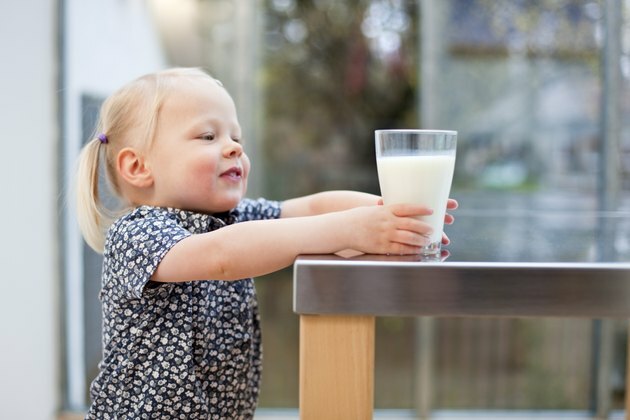 Bedtime training may take a few extra days of lukewarm milk, but eventually the full transition will take place and your toddler will drink cold milk easily.